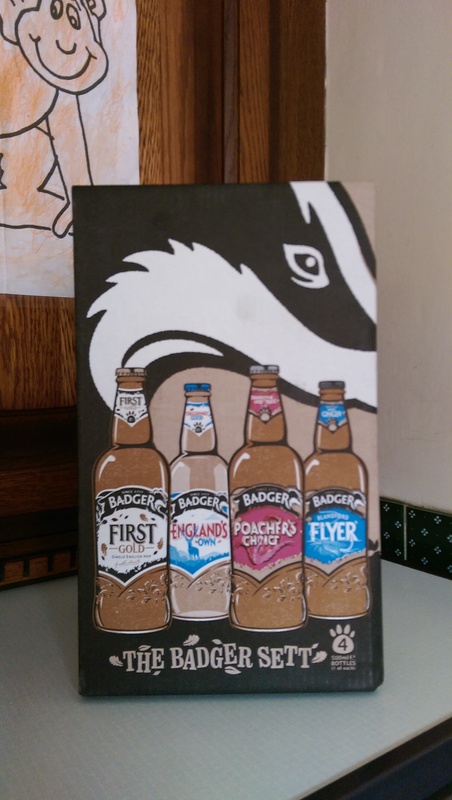 Time for an update, I have been quite busy at work so when I get home I’ve been a little tired and in no mood to type, paint or do very much that can be seen as constructive. 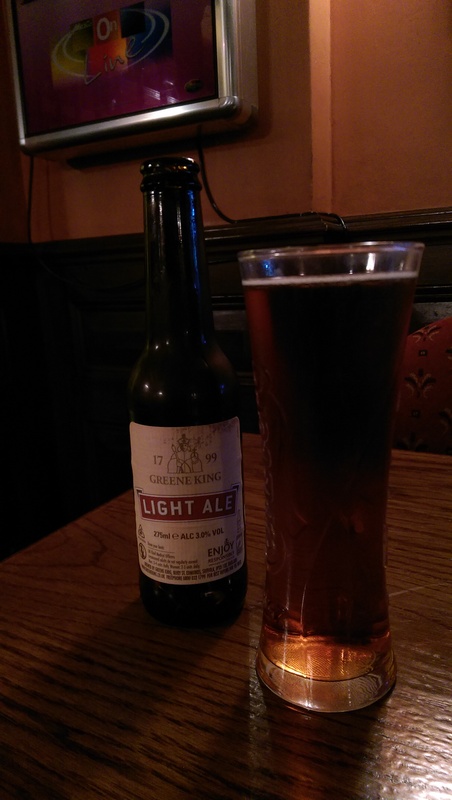 However I have been lucky enough to play two cracking games recently and I thought it was high time I blogged about them and the beer that I have sank in victory and commiseration. 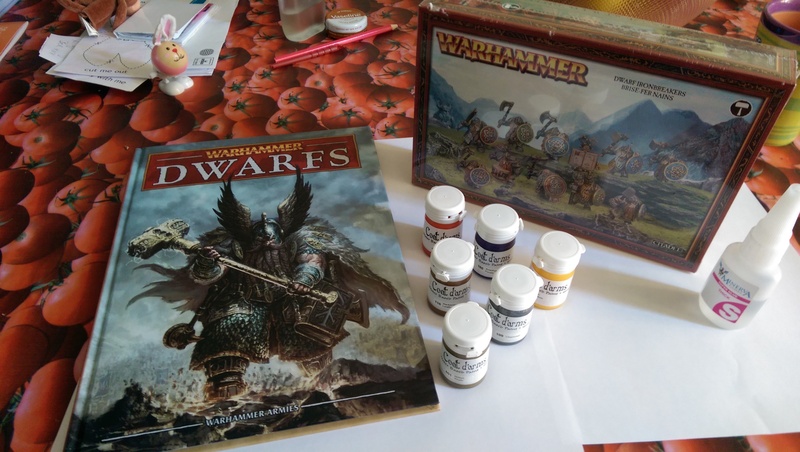 On Tuesday 12th August I woke up early full of energy and enthusiasm for the game of Warhammer I had been planning all weekend. That energy and enthusiasm however took a bit of a beating as I turned on the radio to the sad news that Robin Williams had died. I’m not sure why that effected me as much as it did. I did not know him personally, he was a man, a very funny man from film and television, and now he’s gone. I still cannot bring myself to un-follow him on twitter. But I do not want this to be the tone of my report. 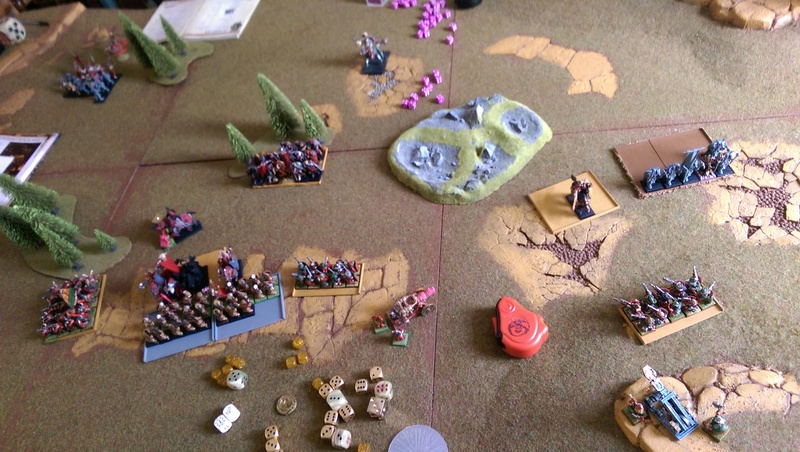 I had some luck with the dice at first winning set up and first turn and made a good number of early wounds. 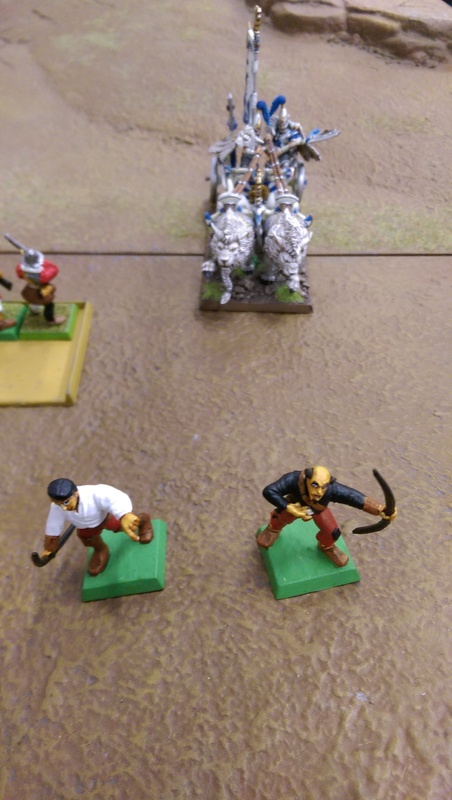 However the skill of my opponent and his army of choice started to shine through and although I had troops left on the field at the end of the game, it was nothing short of a massacre victory for the asur. 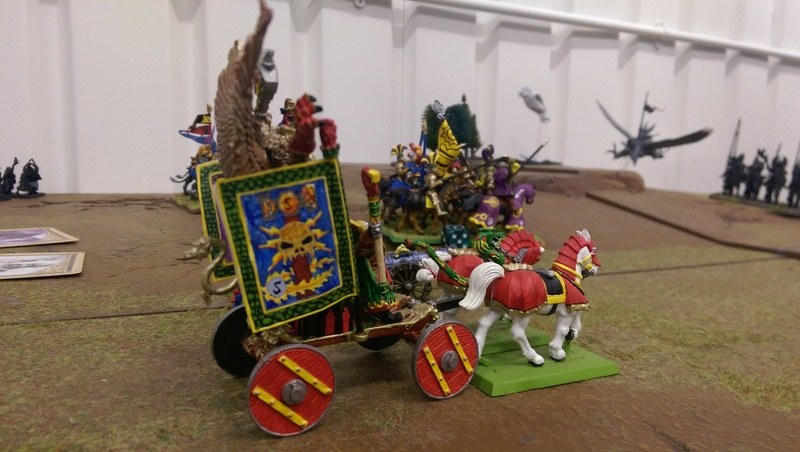 Last weekend my nephew Oscar finally got to collect his ‘Birthday present’ and to try his Chaos Warriors out against a new foe, my Dwarfs. Oscar went for a Nurgle marked warrior heavy force with two units of knights. I opted for my horde of Iron Breakers with supporting warrior unit. I also tried out the Iron Drakes which thankfully weren’t too shabby, and the rejuvenated Flame Cannon, which was pretty a game winner for Grungi’s boys. 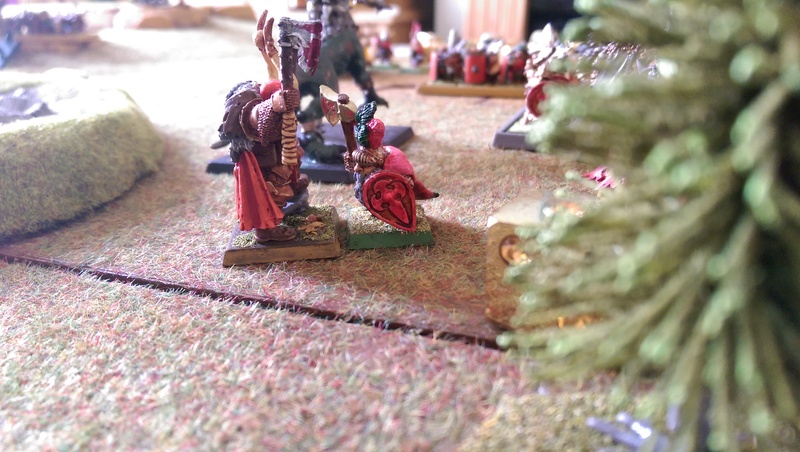 Oscar’s troops took a barrage light artillery before making their first move forward, His Dragon Ogres taking most of the impact. 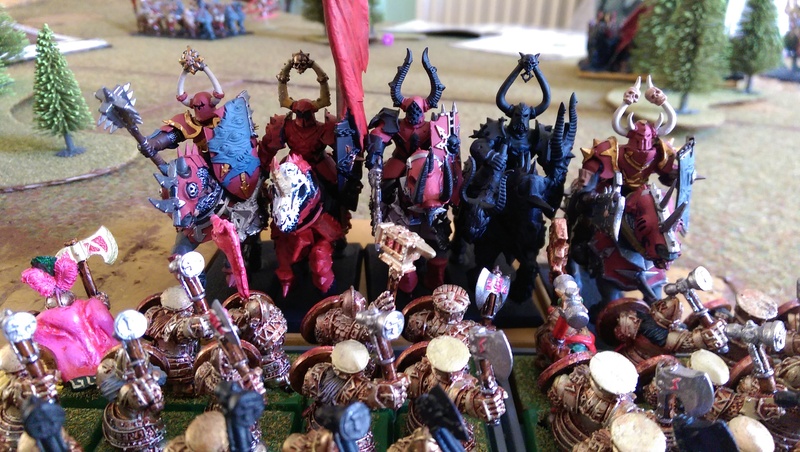 It was about two rounds before any combat started and it was a daring charge by a unit of Chaos Knight’s into the Iron Breakers. The knight stayed for two rounds with small losses between the units, they eventually fled and my thane lead an over run right into some fresh warriors of Chaos with their ex-halted champion, a good opportunity for a personal challenge. The Thane had to endure 6 blows as these mighty leaders traded blows each causing a wound, but neither stepping down. 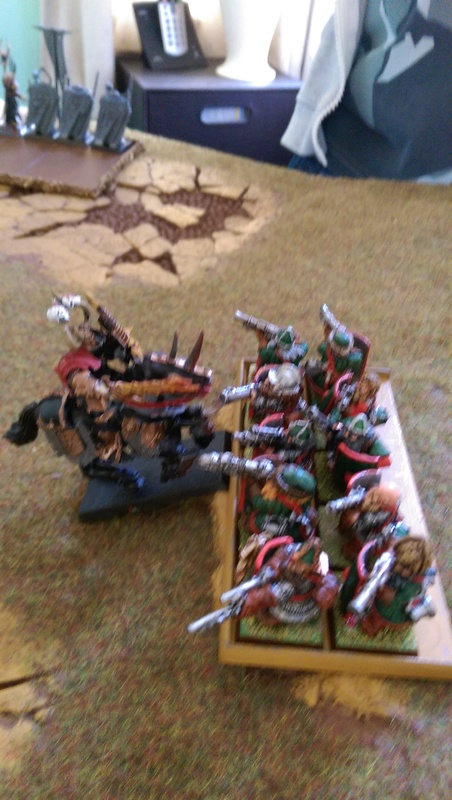 Dwarf numbers proved superior and the remaining warriors carried their leader away in a flow of armoured bodies running for the hills. The forces of Chaos did claim some souls however, I forgetfully left my Gyro-copter to the path of 20 Marauders, and my Dwarf warrior unit could not hold against the charge from the rallied Chaos knights and were mercilessly mown down as the broke from combat. The funniest moment for me other than some attempted game board sabotage by my older brother Daniel, was the fact that my miner unit chose to spend the majority of the game under ground only popping up during the final round to say hello. 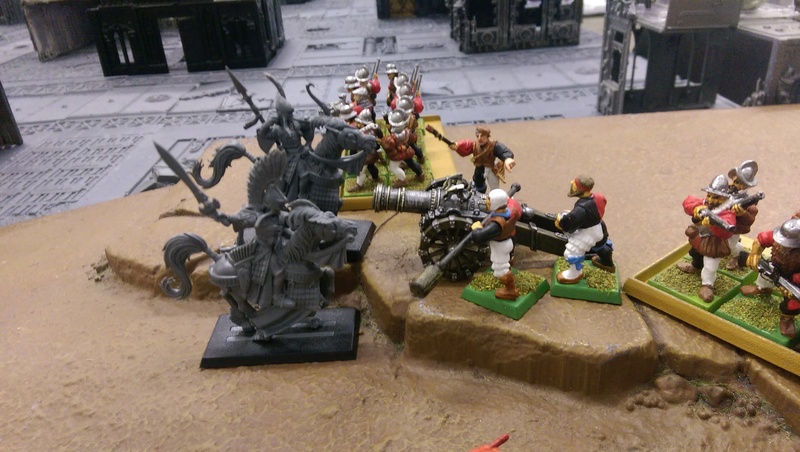 Some post game advice was given to my Nephew to buy more cannon fodder troops to tie up his opponent’s artillery, and then it was time for lunch. certainly worth a try if you come across either of them. 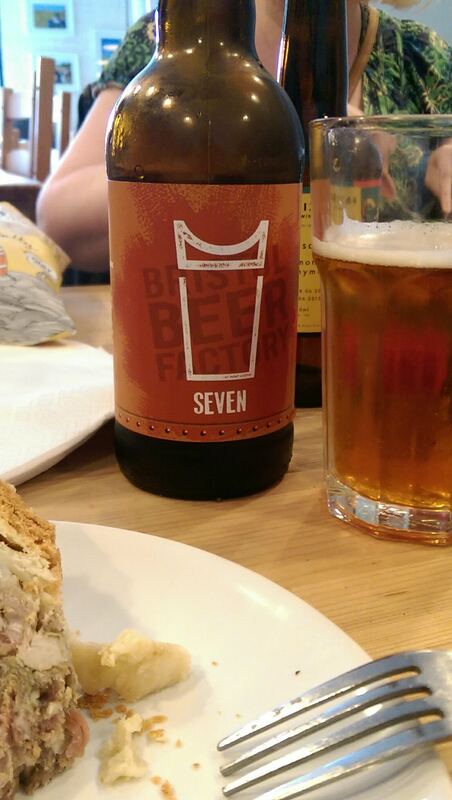 It must be time for a new Blog update. 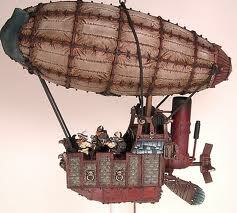 Today I want to talk Warhammer fantasy, current products on the market, and thing that are due to be released. October / November saw the release of the new Dark Elf rule book and a multi-player campaign guide called ‘Triumph and treachery’. Both looked very impressive. 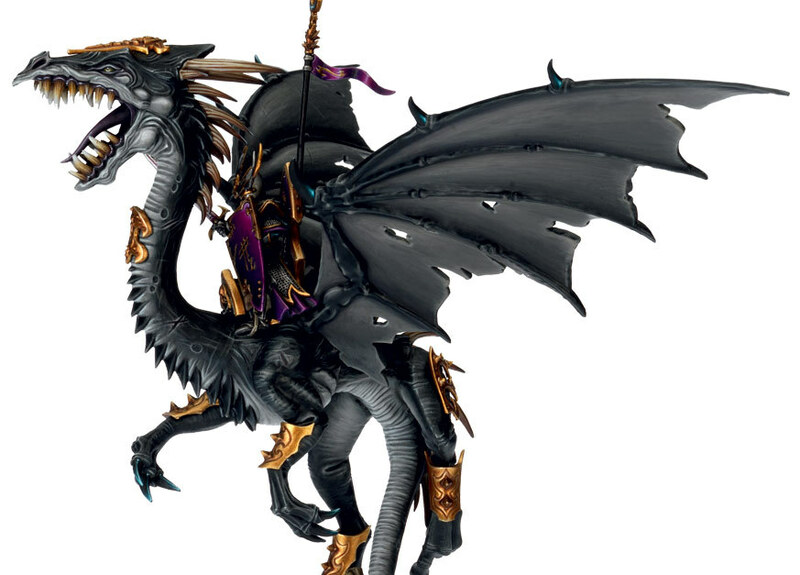 Now I’m not a Drow collector, but I have to say I was very impressed with a number of the sculpts that were released, from new core foot soldiers, fantastic creatures such as a monster called a Kharibdyss, and the new ‘Cauldron of Blood. I am still to get a copy of the army book (I have asked good old saint Nick to assist with this so we’ll see), so I’m not in a place to see if the changes to the army book have any negative impacts to the force put out by the Dark elf player, as a Dwarf collector I often secretly hope for a few unintentional weaknesses within my foe, but they do seem to have done a well-rounded job on this one. 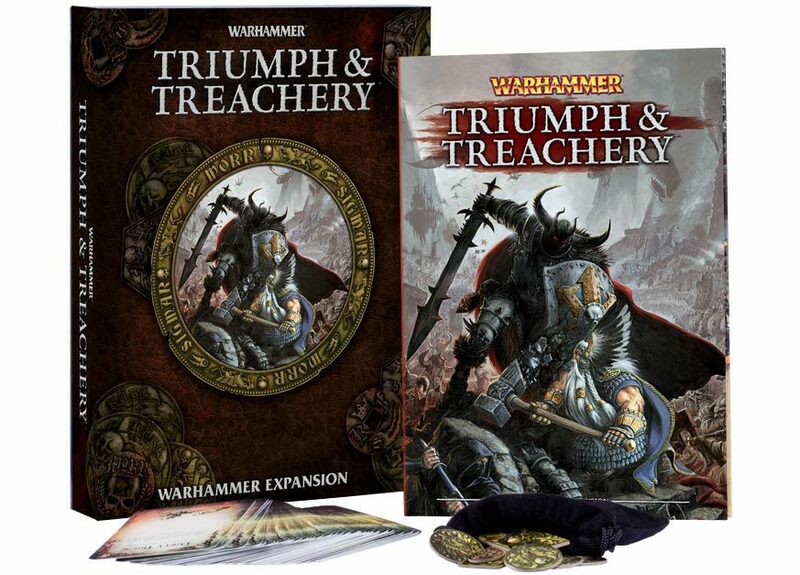 As for ‘triumph and treachery’ I have can only say three words: ‘I want it’. I have been putting together multi-player games for a while now, as there were, until recently 3 regulars in my gaming group. What I like about the triumph and treachery campaign is that it is more than just multi-player, it appears to be a slightly different gaming system. With mercenaries, under hand tricks and a game resolution that is based on what you have killed during the game, it lends itself to a different style of play from regular Warhammer fantasy. 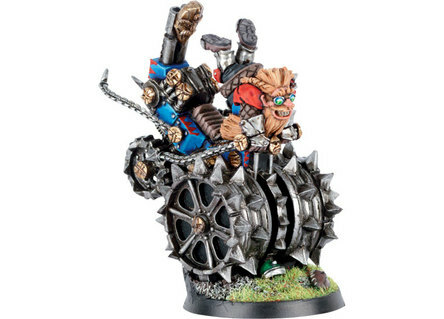 Now rumour has it that next year sees the release of a new Dwarf army book (the first since the beginning of Warhammer fantasy 7th edition) and I’m hoping for good things, we need some good changes because right now the sons of Grungi are just not that competitive. So what would I like to see in the new Dwarf book. Many of the races in the Warhammer world have been given special rules that suit their character and background, the Dwarfs are not exception, but I feel the three long standing rules, Ancestral grudge, resolute and relentless need updating. The hatred of Greenskins and mistrust of elves is still a good rule, but resolute just hampers the already hampered dwarf movement, and relentless which allows dwarf to march even when within 8 of an enemy is redundant now that all armies can do it with a simple leadership test. I like to see some modification with these two rules. Also I would like lord, hero and special troop types to be stubborn to represent the tenacious dwarf spirit. I would like to see the rangers as a separate warrior type, rather than just clansmen / quarrellers who can scout. Give them clansmen statistics and arm them with heavy armour, great weapons, throwing axes ad shields, with an option of swapping the axes for crossbows. As well as scouting, give them a rule that makes them difficult to detect prior to their first move, so they can have an actual impact on the game. Please do not mess with the ‘Anvil of Doom’ too much, it is great that it works in the shooting phase and therefore cannot be dispelled, it made it a viable option that improved dwarf play. Give weapons options to gyro-copters, things such as the template steam gun, but also a mini bolt thrower like the ‘skycutter’ carries, droppable bomb and/or a battering ram which gives +3 on the charge. Allow players to make units of gyro-copters, and consider two seater versions. Please keep the organ gun at auto hit. Please don’t rule out existing special characters in favour of new ones, but please re-introduce some of the old ones like Burlock Danminson or Gotrek and Felix. 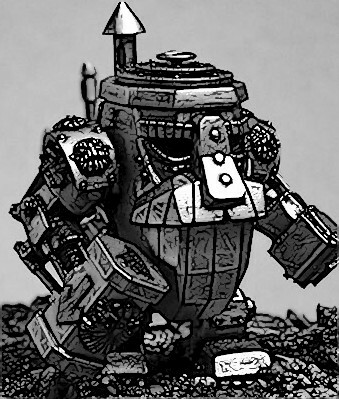 Give Iron breakers something other than just good armour save, they no longer have their 2+ due to 8th edition rule, which is a shame, they used to be little tanks. Been busy, so been quiet. 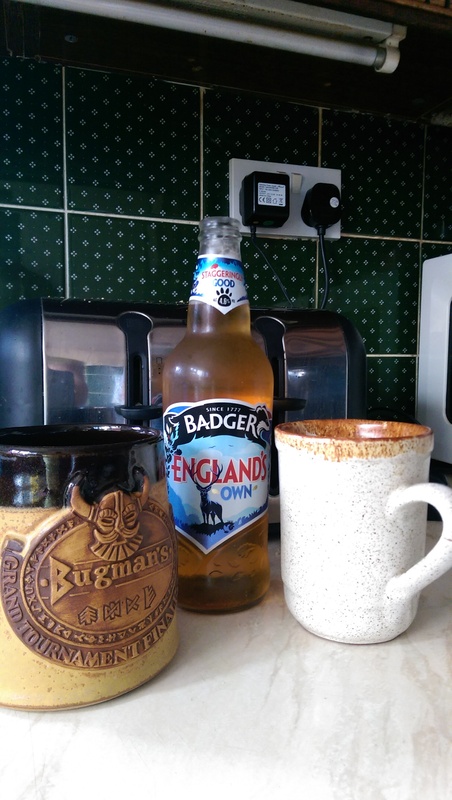 I have not written for a while, real life as ever had become quite busy, and so I have not been able to write anything, not that this is a weekly blog in any case. I want to talk about two kickstarter projects that I have my eye on, and think are well worth the support if you have the money to invest, not that it costs a lot to back. Lords of war if a really very fun trading card strategy game. 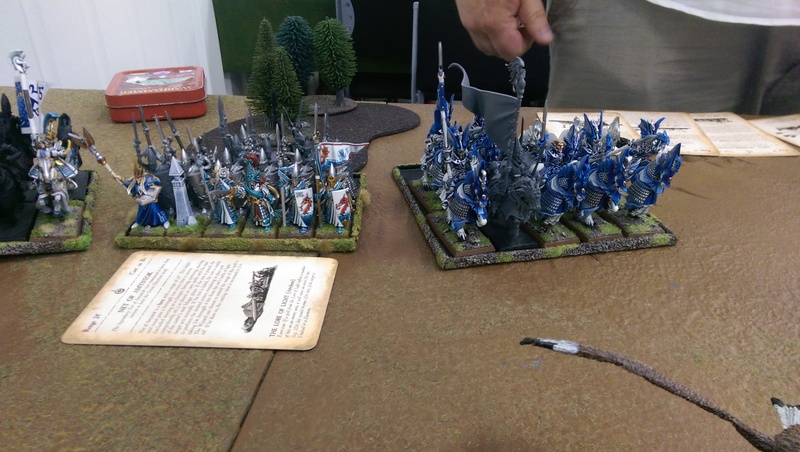 I played the ‘Dwarves Vs Orcs’ game at Salute this year, it was a fun 1/2 hour, and is a good collector game for those who don’t want to paint before they can play. The cards are nicely details with some good art work and the company has kept the price very reasonable. As well as the Dwarf set there is a second set which features Elves Vs Lizardmen. 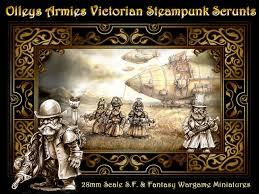 The second kickstarter is for a new range of models by veteran sculptor Bob Olley, who is hoping to release a new range of steam punk style figures, his first outing is a set of Victorian Dwarves. 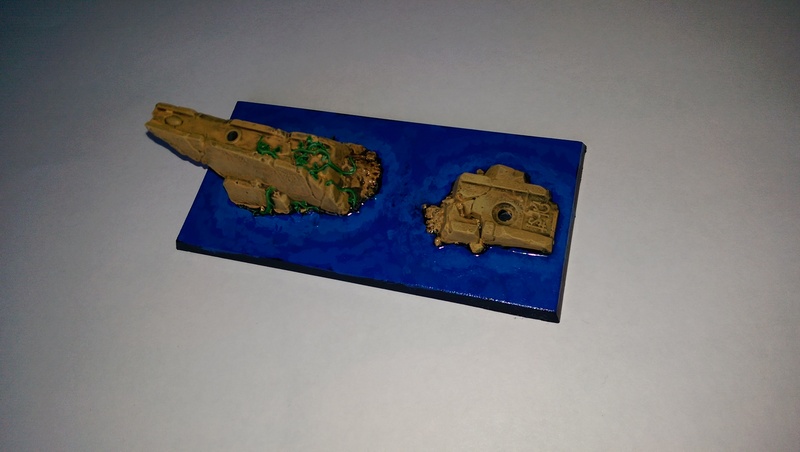 For those who do not know Bob Olley is a talented sculptor who has worked for the likes of Games Workshop, Reaper Miniatures, and Ral Partha, now he’s free lance and his work is well worth backing if you have a penny or two to help him raise his bid. I really like his sculpting, and if you are/were a fan of Games Workshop 40K Squats check out if Space Scrunts.